sarahf (Sarah Frostenson, politics editor): Monday night marked the filing deadline for first-quarter political fundraising numbers. Bernie Sanders led the pack with $20.7 million,1 74 percent of which came from small donors, or those who gave $200 or less to his campaign. And if we just look at contributions from individual donors (so excluding campaign transfers or candidates who self-fundraise), Kamala Harris came in second behind Sanders’s $18.2 million raising $12 million. By this metric, Beto O’Rourke came in third with $9.4 million and Pete Buttigieg in fourth with $7.1 million. So what does it all mean this far out? What were some of the biggest surprises and what does it tell you about the health of some of these campaigns? perry (Perry Bacon Jr., senior writer): If you had told me in January that Buttigieg would raise more money from individual donors than Sens. Elizabeth Warren, Amy Klobuchar, Cory Booker and Kristen Gillibrand, I would have said that you were insane. So that’s definitely the biggest surprise to me. natesilver (Nate Silver, editor in chief): I’d agree that Buttigieg has been the biggest upside surprise of the Democratic primary so far. And that Warren has been the biggest downside surprise, at least in terms of fundraising, because she always raised a ton of money for her Senate campaigns. Everything else is pretty much to form. Sanders’s fundraising total is neither underwhelming nor overwhelming. Harris and Beto’s fundraising numbers are decent but not great, which is exactly where you’d describe their standing in the polls too. maggiekb (Maggie Koerth-Baker, senior science writer): I was doing an interview with Richard Briffault from Columbia Law School last week, and one of the things he told me was that small donations have, historically, been tied to more polarizing or extremist candidates. Which makes sense if you think about what might get someone really fired up to send in that $30 or whatever. It’s things like personality or somebody who’s pushing policies that are outside the (presumably better-funded) mainstream. But then Briffault cited people like Buttigieg, who he called “the epitome of a non-extremist” and who is running this small-donation campaign that’s meant to appeal to middle-of-the-road voters. So he’s watching both that campaign, and O’Rourke’s, to see if they turn out to be the things that upend this conventional wisdom that campaigns that attract small donors can’t be moderate campaigns. sarahf: Carrie, does what Maggie learned from Briffault reflect what you’ve heard in your reporting? Or how should we think about the rise of small donors? carrie.levine (Carrie Levine, senior political reporter at the Center for Public Integrity): I’ve also heard that small-dollar donors can be more polarized than large donors. It’ll be interesting to see whether that holds true this cycle with candidates’ increased focus on expanding the small-dollar donor pool. Another question to consider about the rise of small donors is that we don’t really know how large that pool can get, or whether there’s a limit to how much they’ll give. On the Democratic side, donors are being heavily courted by multiple candidates, so now lots of strategists are watching to see if donors get exhausted before we get to November 2020.
perry: Looking at other first quarter fundraising numbers, I thought Bernie’s numbers were really strong. I’m not saying it’s surprising, but he does have a huge number of small donors, which is both a sign of intense support and a valuable resource, as those people can give multiple times before they hit the contribution limit. I was pretty sure he would be a formidable candidate in his second run, and his first quarter fundraising helped confirm that. carrie.levine: One other interesting note on Bernie: his campaign said about 20 percent of first-quarter donors were new to his campaign, which is a sign that he’s appealing to people who didn’t necessarily give last time. natesilver: I don’t know. Sanders was raising around $30 million a quarter in the 3rd and 4th quarters of 2015. He raised $44 million within a month in March, 2016. So I don’t find his numbers all that impressive this time around. I think they’re right in line with (reasonable) expectations. sarahf: But surely, Nate, part of the reason Bernie is bringing in less money is because this time around there are 16 other major candidates, including Bernie. And if 20 percent of the first-quarter donors are first-time givers like the campaign says, that’s at least somewhat promising, no? natesilver: It’s consistent with a world where Bernie is polling at 20 percent, after having received 43 percent of the vote or something in 2016. On the one hand, in a field with more than a dozen candidates, 20 percent is good enough to make you one of the frontrunners. On the other hand, it still means you’re well off your benchmarks from 2016, because some of your support has also gone to other candidates. 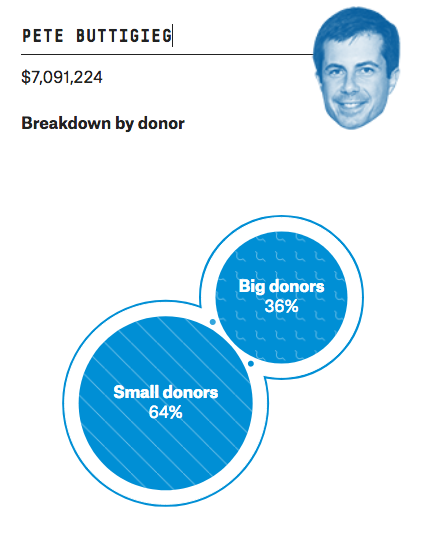 So definitely some real downsides to the Democratic field being this large — candidates just aren’t bringing in as much money even if donors are giving to multiple candidates. natesilver: I also think Trump’s $30 million number is pretty underwhelming. sarahf: Nate just thinks everyone could be fundraising better. natesilver: Well, yeah. I just don’t get why people are so impressed by any of these numbers, in an era where online fundraising has massively increased the ability for candidates to raise gargantuan sums of money in a hurry. Again, Sanders raised $44 million in a month in March, 2016.
maggiekb: If campaigns are going to be courting small donors more, they’re right to do it during the primaries. One of the big takeaways from a story we did last year on the social science around campaign fundraising was that the money you raise (or, for those playing at home, the money you donate) matters a lot more during the primary. By the time you get to the general, the outcomes are much more driven by partisanship, and frankly most candidates are raising and spending way more than most of them actually need to get elected. So, I guess, if you’re a small donor, burn yourself out now! carrie.levine: Anecdotally, I am also hearing a lot about donors spreading money among different candidates. We see some overlap in the data we have on contributors who give more than $200, but the small donor data that will be released by ActBlue, the payment platform used by all the Democratic presidential candidates, in July, will give a better picture of that. perry: Do we think giving to multiple candidates is a sign of indecision? For instance, in 2016 I assume there were few people who gave money to Clinton AND Sanders. But are we now in a situation where people like several candidates and don’t want to choose just one? carrie.levine: I also have heard in my reporting that the Democratic National Committee’s decision to set a grassroots fundraising criteria as a way to qualify for the first two primary dates has prompted donors to give to multiple candidates that they would like to see on the debate stage. Some candidates have even directly referenced the debate thresholds in their asks. perry: In other words, the emphasis on having a lot of donors is affecting the nature of the campaign. Like, $1 donations are not particularly useful for say, campaign ads, even at a fairly large scale, but are useful for qualifying for the debates. carrie.levine: Exactly. But a lot of candidates did ask for $1 contributions, or $3 or $5. Which, of course, also has the ancillary effect of putting the $1 donor on an email list so they can be asked repeatedly for more money. It would take a lot of $1 contributions to hit the maximum contribution. But as CPI’s data editor, Chris Zubak-Skees, points out, it’s also not free to raise those $1 contributions. sarahf: My understanding was that part of the reason why the DNC introduced this fundraising threshold is that they saw candidates with large numbers of small donors as a good way to measure enthusiasm. Is that right? Or is this a flawed way to think about fundraising? 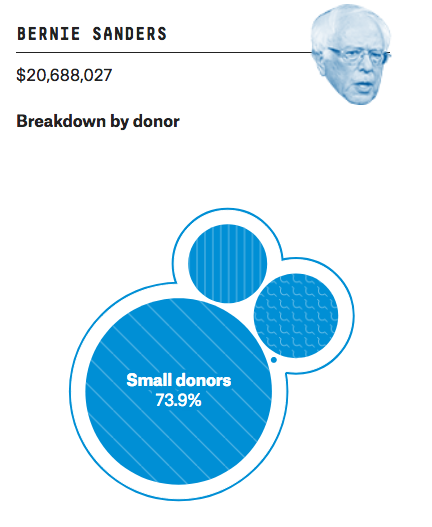 natesilver: Yeah, I wonder if there’s an overcorrection toward these tiny donations. On the one hand, I suppose the theory is that once you sign someone up for any amount of money, they can contribute a lot more in the future. On the other hand, running for president is expensive, and some of these candidates haven’t raised enough money to run a full-fledged campaign, even if the donor number is impressive. sarahf: So that brings me to my next question. I know it’s early yet, but what do these fundraising numbers tell us about the health of some of these campaigns? It might not be anything we don’t already know, i.e. John Delaney was always a bit of a long-shot candidate, but the fact that most of his money was self-raised, and he spent a lot of it … means he could be in trouble, no? By the same token, maybe this spells trouble ahead for Warren? A good bulk of her money was transferred from her 2018 Senate campaign and she also had a pretty high burn rate. perry: Delaney is very rich. He will be fine. carrie.levine: I think it’s tricky to say whether someone is in trouble because some of the candidates have access to pots of money besides what they get from individual contributions. Gillibrand, Warren, Booker and Klobuchar, for example, have all transferred money from their Senate campaigns to their presidential campaigns, though that cash won’t last forever either, of course. perry: Warren still has a lot of cash on hand ($11.2 million, second only to Sanders at $15.7 million), so now if they know they are going to have trouble raising money, her campaign can at least adjust its spending. sarahf: Sure, but as Nate said, running a campaign is expensive! And if more and more Democratic candidates are shunning big dollar donations from corporations and PACs, and can’t win over enough small-dollar donors that will put some real strains on their staffing or campaign outreach needs. natesilver: Goodhart’s Law states that “When a measure becomes a target, it ceases to be a good measure.” Meaning, once someone caters their strategy to meet a certain statistical benchmark, it’s no longer as useful as when someone reaches it organically. Small-donor contributions are a proxy for grassroots support, but ultimately they’re just a proxy for it and what you really want is for people to show up at the polls and vote for you. carrie.levine: Right, dollars aren’t votes. That’s always the catch with looking at fundraising. But, Nate, one more thing to consider is whether a boom of small-dollar donors is ever completely organic. Campaigns spend money on list acquisition, for example, and on online ads to serve up to potential supporters. Prospecting for small-dollar donors costs money, and isn’t as spontaneous as it can appear. maggiekb: And how much of fundraising is really just about being a proxy for support, or a narrative to prove to the media that the candidate has support? There’s a lot of evidence that suggests advertising (the main thing donations get spent on) doesn’t really work all that well. Or, at least, doesn’t create a bump that lasts long enough to affect actual votes. natesilver: The money matters, so it’s not just a proxy. The Democratic calendar is front-loaded, so even though it’s easier for a candidate to go “viral” in the age of social media, you’re still going to have candidates who survive Iowa and New Hampshire, who need to quickly build out a ground strategy in California, Texas, Virginia and all these big, expensive states that vote on Super Tuesday. That takes resources. However, fundraising has historically not been a super great predictor of primary outcomes. It’s generally worse than polls and worse than endorsements. It is quite a useful predictor in House elections, though, and to some extent Senate and gubernatorial elections. But with presidential elections, less so. And that’s partly because beyond a certain point, candidates encounter diminishing returns, e.g. raising $600 million vs. $500 million probably doesn’t matter much. But, say, $10 million vs. $1 million probably matters a lot. maggiekb: I keep feeling like I’m trapped in a pit of conflicting data when it comes to fundraising research. Or maybe not exactly conflicting, but it just feels messy. Like this stuff Nate is talking about with fundraising not being a good predictor of primary outcomes. Meanwhile, the political scientists tell me that while the biggest fundraisers tend to win the general elections, that’s not usually BECAUSE they raised the most. Like the money is a predictive factor, but not the cause. It’s now a favorite quote of mine. carrie.levine: The candidate raising the most money may not win the primary, but the candidate raising the least — self-funding aside — is going to have trouble competing. sarahf: Right, so where do we see trouble? And did any of it surprised you? natesilver: Yeah. Warren probably needs to be at least a little bit worried, because she has a well-staffed, expensive campaign with a high burn rate. The candidates in the Julian Castro/John Hickenlooper/Jay Inslee group might be a little worried. perry: The senator-candidates, excluding Harris, should be worried that the polls and the fundraising are telling the same story — they are basically even (Warren in polls) or behind the mayor of South Bend right now. But if I were Beto or Harris, I would be worried that another establishment, big-donor friendly candidate (Biden) is probably entering the race. It’s not that Sanders donors are suddenly going to give to Biden, but big donors might be deciding among those three. 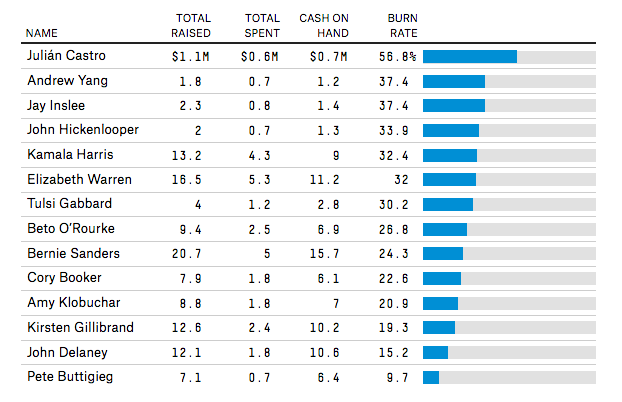 natesilver: I wonder how much money Biden would raise. His support skews older and probably low-to-middle income, which might actually be a disadvantage from a fundraising standpoint. perry: I tend to think he will have a lot of trouble raising small-dollar donations (I don’t know if Biden has a passionate base), so I think he will be really trying to woo the big money. natesilver: Yeah, he might be willing to do the whole traditional rubber chicken / $2,800-to-buy-a-photo-with-the-candidate-and-a-couple-of-glasses-of-decent-Chardonnay fundraising thing, which a lot of candidates seem to be eschewing this cycle. carrie.levine: One question about the eschewing of the traditional rubber chicken circuit this cycle is whether it will continue past the primary. But yes, I’d be very surprised if Biden walks away from the traditional donor base that can write a $2,800 check and has supported him in the past. perry: Are the kinds of voters attracted to Biden also the kind of people who don’t care about issues like super PACs? Maybe no voters care about super PACs, but I think Sanders and Warren in particular would face immense backlash if they had one. natesilver: That’s part of Biden’s advantage, I think. He isn’t trying to seem “woke”, for lack of a better term. That’s not where his voters are, anyway. So he can do all sorts of stuff without taking a hit to his brand, that might be a tougher call for Warren or Beto or whomever. carrie.levine: And online fundraising has surged in the years since Biden was last on the ballot. How he’ll do is still really an open question, even though conventional wisdom seems to be that he won’t do particularly well. We just don’t know. perry: Good point. Maybe Biden will be a fundraising juggernaut on online. I don’t know — I’m assuming he doesn’t have a big small donor base, but I didn’t think he would be leading in the polls either. sarahf: It’s not just Biden who faces this fundraising question. There’s already a bit of a divide in where candidates are getting their money. For instance, both Gillibrand and Booker are two candidates that still rely heavily on big dollar donations. Granted, I do think within the Democratic Party, at least, this form of fundraising is less popular. carrie.levine: Yes, though Gillibrand has also courted new donors. For example, she has really encouraged women’s giving circles. My colleague Sarah Kleiner and I touched on that in this piece. sarahf: OK, what should we be looking for in Q2? Do we think we can expect to see candidates’ campaigns folding because they aren’t bringing in enough cash and aren’t rising in the polls? Or do we think we’ll see more consolidation around one candidate? What will you be keeping an eye on? carrie.levine: I think candidates who post anemic fundraising totals for two quarters in a row will be under some pressure to get out of the race so the field can consolidate, so I’ll be looking for that. I’m also interested in the total universe of donors giving to presidential campaigns and how big that gets, given the aggressive courting of new donors for small amounts. A growing number of unique donors engaged in giving to Democratic presidential campaigns is definitely something to watch. perry: Harris started her campaign fairly early (Jan. 21) and raised a lot from big donors. That worked in the first quarter, but it will be interesting if she finishes second again. Warren is getting attention for releasing a lot of detailed policy proposals — but does that turn into donations? Does Mayor Pete keep up his buzz? Beto raised $6 million on the first day and fairly little afterward. Does he raise a lot in the second quarter? What does Biden raise? And yes, I think we will see 1-3 candidates drop out, although there is a lot of incentive to stay in the race through at least June, when the first debates happen. sarahf: Yeah, Beto is going to have a lot to prove in Q2. But who knows, he could have his Buttigieg moment! natesilver: It’s very likely that Buttigieg and Sanders will continue to raise a lot of money in the medium term, but I’m more interested in what Beto’s bringing in on a sustained basis. And keep in mind that we don’t have any debates until the end of Q2, which makes viral moments a bit more unlikely. This quarter right now is going to be by far the most boring quarter of the entire primary process, in fact. NOT THAT YOU SHOULD FORGET TO CLICK ON FIVETHIRTYEIGHT.COM EVERY DAY. That’s the case when we look at the total amount a candidate raised, regardless of whether it’s earmarked for the primary or general election, and include money transferred from another campaign or donated by the candidate themselves.